This year’s Jeep Safari has to be one of the best yet. The trek out there went pretty smooth and we couldn’t have asked for better weather. We were able to take our Rubicon out with our Long Travel High Clearance kit on it. We’d done quite a bit of testing on the new setup back home but this was the maiden Moab voyage and it even impressed us. The articulation was just what we were after. The 35x13.5 tires rubbed the arms a but but we can fix that with steering stop adjustment or wheel offset. We’ll have the High Clearance version of our Long Travel kits available for Cherokee and Grand Cherokees soon as well. We got a new tent for the show at the arena so our booth stood out a bit more than normal. Thanks to everyone that stopped by to say hello. It was good to see all of you and appreciate your patronage. We were happy to have the shop’s orange Cherokee out as well this year. We didn’t bring it last year and were shocked at how many people were disappointed it wasn’t there. We had both rigs parked near the arena so we could show off work we’ve done to them. This year we added some custom Mastercraft seats, an ARB Fridge and a custom stainless dash to the Cherokee. Both rigs ran BFG Krawlers. 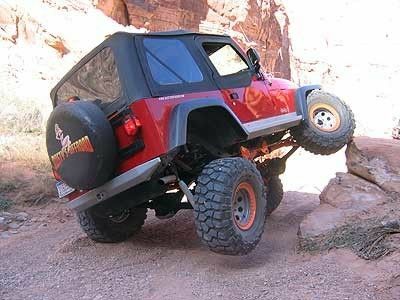 Just about any tire will work well on the sandstone in Moab but the BFGs worked great for us. We aired them all down and were glad to see them spread out for even more traction. The weather was about perfect this year. The full moon had us running some trails at night without headlights! The moon lit up the trail markers and it’s shadows gave the trail a whole new look. You had to be a bit more careful as you crested a hill just to make sure you were still on track and not about to drop off a ledge. Even the day runs were nice. Although it was a bit hot, the breeze kept things cool. The scenery as always was spectacular. We’d like to thank Red Rock 4-Wheelers for putting on this great event once again this year. They have created a M.U.D. fund to help with the legal fees associated with defending trail closure issues in the Moab area. We created some Jeep Safari specific shirts this year. A portion of the proceeds from the sale of this shirt will go directly to the M.U.D. fund. We encourage you purchase a shirt to help out the fund or make a donation directly to the Red Rock 4-Wheelers to make sure this majestic area is open for our families for years to come.